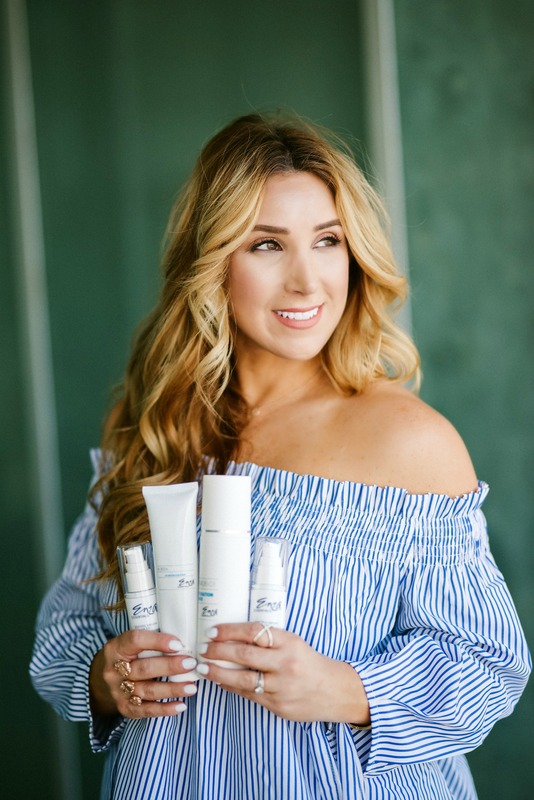 Popping in to share some of the beauty products that I use nearly every day when I’m getting ready for the day. I’ve mentioned before here on the blog that my go-to skincare regime for the past year or so is Enza Essentials. The last time I ran out of my products, I could definitely tell a negative effect. My skin wasn’t nearly as hydrated and healthy-looking when I was off the system. Sometimes it takes being off of something to know if it’s really working or not, ya know? This skincare line is customized to fit your particular skin’s needs. You can find what I use here, but if your skin’s needs are different than mine, definitely consider filling out this quick form and they will customize the right combination just for you and send it all to you at 30% off and with free shipping. If you’re looking to do a skincare overhaul this spring, consider trying them. I really think you’ll love it as much as I have over the past year! This stuff! Friends, this foundation is nothing less than amazing. There I said it. Not being dramatic, just stating a simple fact. I discovered this foundation last fall and I have been pretty much obsessed with it ever since. It gives you THE best airbrushed finish and coverage, hands down. Can’t say enough great things about it. So this has been a highly anticipated new product in the Ashley Sievert line for several months now and I’m happy to report that it is finally available to purchase. A little goes a really long way with this bronzer, so you need to be sure that you’re light handed when you apply it. I absolutely love it when combined with the next product below. Gives you the best bronze and illuminating look. I’m now on my third purchase of this particular highlighter. That’s how much I love and use it. I used to feel like my skin always looked ‘flat’ and dull after I was done applying it. When I started using this just above my cheekbones and a little on my forehead, I felt like it added so much light to my face. Raise your hand if you loathe the process of washing your hair? (My hand is waving wildly in the air!) You guys, this may very well be the task I dread the most each week, next to doing the dishes. I have kind of a process for wearing my hair based on how clean it is. Ha! This dry shampoo/volumizer has been key to being about to go a little longer than I should on the hair washing front. I use it for simple texture and volume on day one and then as a true dry shampoo after that. Good stuff. You may already be using this gem in your daily routine now that warmer days are here. If not, seriously give it a try this summer! 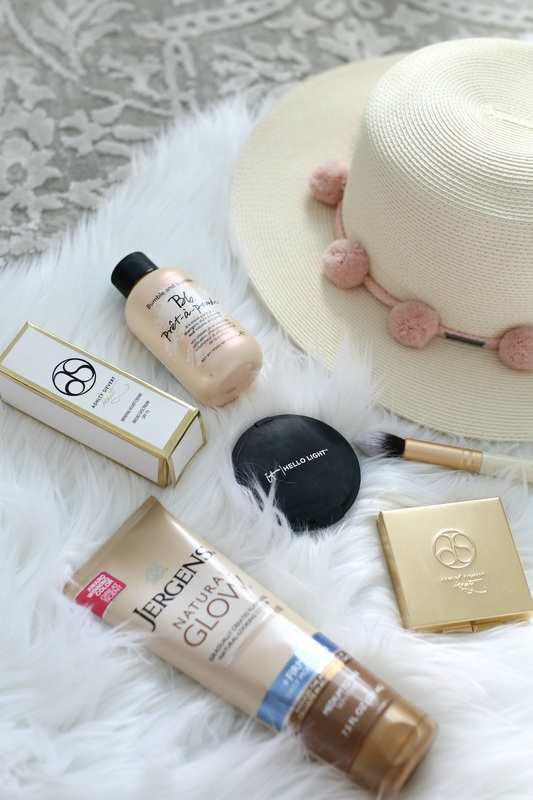 I use this self tanner each week, but I also supplement each night with this Jergens Natural Glow Daily lotion to keep my skin hydrated and to also extend the life of my faux tan. *There may be affiliate links in this post. Thank you for supporting this blog and the brands that make it possible.